MANUFACTURER WARRANTY STILL APPLIES! BEAUTIFUL ONE OWNER FR-S. With an astonishing almost perfect car score on various sites this is your ultimate sport ride! The 2015 Scion FR-S earns a high ranking thanks to its excellent overall performance - specifically, its thrilling handling. This coupe is also on the low end of the class for ownership costs, boasts a solid list of standard features, and has great safety scores. 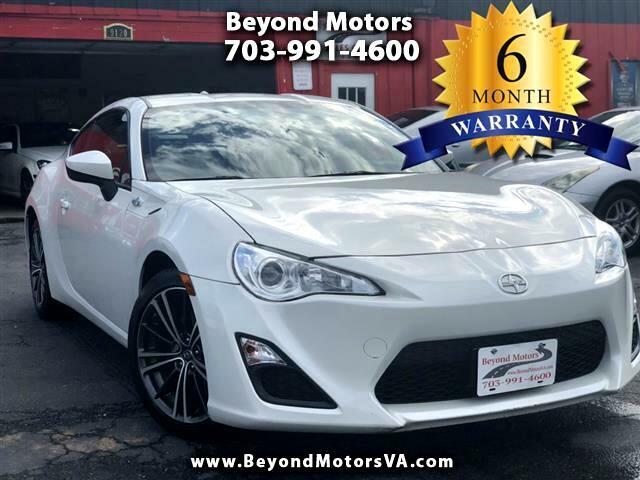 Call Beyond Motors (703) 991-4600 to schedule your test drive. More Photos: www.BeyondMotorsVA.com WE FINANCE EVERYONE!! Excellent Credit? Rates as low as 1.49%, First Time Buyers/Students? As Low As 2.99%! Bad Credit is OK, Low or No Credit is OK. Open Bankruptcy is OK. Your job is to pick your car and let us handle the rest! Beyond Motors provides high quality vehicles at the lowest prices guaranteed! All of our cars go through precise diagnostic in our in-house Service Center to ensure that they are in perfect driving condition inside-out before our valuable clients drive away! We also offer a variety of warranties at very competitive prices for your peace of mind. Please, stop by and experience a different used car buying experience. Message: Thought you might be interested in this 2015 Scion FR-S.